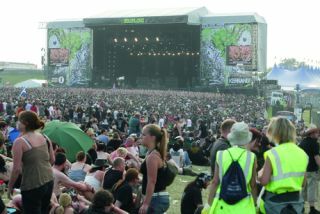 Day three at Download and it's shaping up to be another great one. We've got a classic rock feast with Saxon, Cinderella and FM (who stepped in at the last minute for Ratt) before the mighty Slash on the Main Stage. Which isn't a bad start to the day, is it? The rest of the day isn't too shabby either. We can't wait to see Joey Kramer laying down the beats for Aerosmith tonight, but there's also Motorhead, Stone Temple Pilots, Steel Panther and a load more. Of course, the best way to keep up to date with all of the goings on from the festival is to keep checking out Twitter page and this very website. We'll report back throughout the day and lookout for a review of the day online tomorrow morning!